I’m part of the wider Creative Inkers Team and we are having a blog hop! You may have just come from our talented team leader Jacque Williams blog or from one of the other girls on the blog hop.If you get stuck ..click on the links at the end of my post. So, this is a Christmas Catalogue Blog hop. Ive been making some Christmas cards lately..never too early to start! 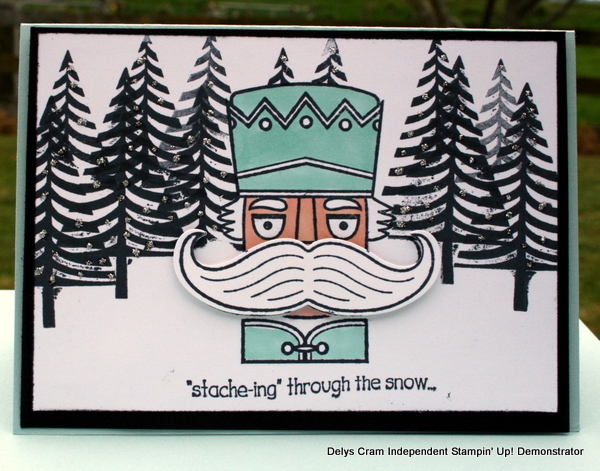 First up is A Festival of trees/ Santa Stache and the moustache framelet die.. I coloured in the soldier with my Blendabilities (skin tone and Coastal cabana) . I have also added some silver sparkle Dazzling details. Next ..I got my brayer out..haven’t brayered for awhile. 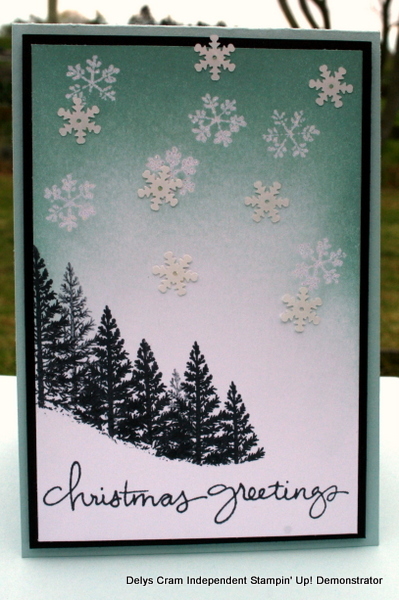 This card also used the Festival of trees set and also uses the Endless wishes stamp set. The snowflake is embossed with Iridescent Ice embossing powder..and then I added some more snowflakes using the very cool Frosted sequins. I did another brayered card but wasn’t that happy with it ..showed a couple of my downline and they really liked it ..so sharing that one too.. This set is called White Christmas. All three use masking as a technique! A finally, after doing 3 cards, i had some cardstock left over so made a tag. Okay now thats me …now we are off to one of my talented uplines ..Rachael Knight. Click on the link below. If you get stuck along the way then click on any of these links to carry on. Gorgeous projects Delys, as usual!! Glad you shared the second brayered card as I love that one too. LOL if you’re not going to horde the snowflakes, I might be doing your share – have not used this year’s ones yet but I used lots last year! Great brayering Delys! Looks like you only had your brayer out yesterday. 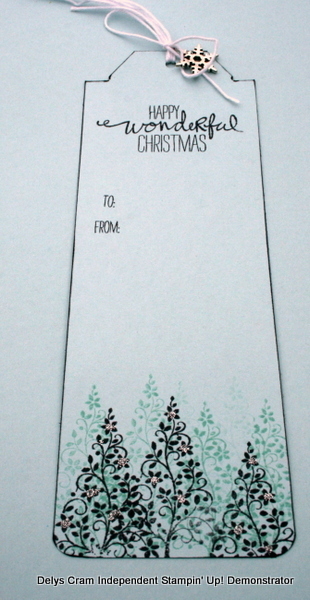 And I love that White Christmas card too! Love it, Delys. might have to get the brayer out! The second one is my favourite. The snowflakes just add to it. 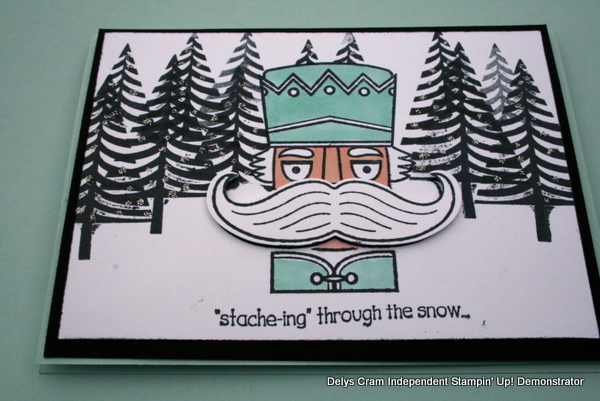 The festival of trees is such a versatile stamp set, loved the way you have used it. Great projects – as always. I think the second card is my favourite. I’m very jealous of cards with brayering – it’s something I can’t seem to get the hang of! Thanks Paula ..I made these for a recent team training as a few in my team feel the same..next time I see you I can give you my tips! Oh Delys! You done it again absolutely fantastic assortment of Christmas inspiration. Love the trees and the way they slope down the snowy hill. Love this gorgeous set of cards and especially the colour scheme. 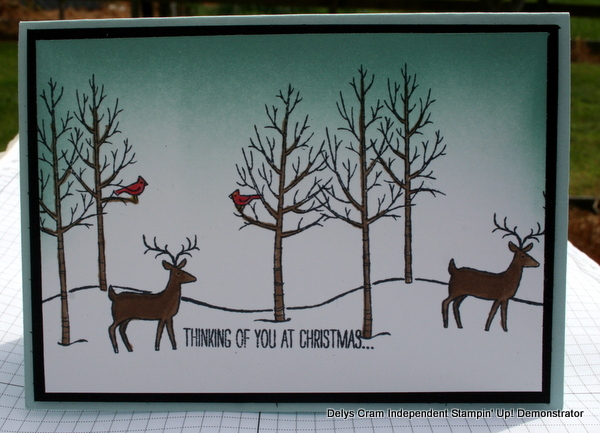 My favourite card is the one with the deer – stunning.